Experts say that you shouldn’t look at your pension investments too often as you might make unwise decisions. I don’t follow this advice. The reason that I’m drawn to tending my pension spreadsheet weekly, if not daily, is two-fold. First, I’m told by professionals who read the tea leaves on this sort of thing that I have Asperger’s syndrome. It turns out that pawing over columns of numbers in Excel is nirvana to certain of us oddball hues on the autism spectrum. Second, for ten years I have had a fascination, bordering on dread, for the incremental drama of two charts in my spreadsheet, both of which are shown below. Paradoxically, neither chart directly relates to my investments. However, they have guided the timing of when I move money around in my accounts – shifting between riskier stock indexes to safer bond funds. So far, my strategy has worked. For example, my pension fund suffered little during the 2008 financial crisis, and from lesser bouts of turbulence in 2011 and 2015. So how does my investment approach work? It’s quite simple. The top graph in red shows a rolling 3-day standard deviation (SD) of daily oil price – specifically calculated from the Brent crude oil index. The chart below it in blue is a rolling 3-day SD calculated from the Dow Jones Industrial Average. Whenever, the red chart (i.e., that of oil) develops a cluster of large spikes that is sustained for a few months or more, I’ve noticed that a similar cluster turns up a few months later in the stock market. More importantly, I’ve learned that you don’t want your money in stocks when this is happening, so when the warning signs occur in oil, I march my money off to the relative safety of the bond market. To illustrate this, I’ve marked the date (in red) of the largest spike (what I call the “max spike”) in 5 clusters of oil price volatilitybetween 2000 and 2018 with gray arrows and lines. If you follow these gray lines down to the blue arrows in the blue stock graph below, you will note that similar prominent clusters of spikes follow within a year of the oil clusters in the Dow 4 out of 5 times. Observe that there is one exception (in 2004) to this relationship, which I will return to later. What the peaks and scarps on each graph represents, as I’ve discussed numerous times starting from 2010 at oil-price.net, is an estimate of volatility level in each of these two markets on any given trading day. A consistent theme in my articles is the charts reveal that economic disruptions, such as ructions in the stock market, tend to follow periods of marked instability in the price of oil, and further, that the economy at large appears to be acutely sensitive to sudden changes in the cost of energy – as mirrored by the longest lines on the chart above. The most memorable recent example of this relationship was a large spike in oil price beginning in 2007 that culminated in a colossal spike in volatility that occurred on the 9th of June 2008. The turbulence in oil was followed by trauma in the equity markets that reached its climax just a few months later – as reflected by a “max spike” in stock volatility on the 15th of October of 2008. I’ve also pointed out that the “Black Monday” crash of 1987 fits this long-term historical pattern, as it occurred in the wake of a huge collapse in oil price in 1986. My near daily obsession with the evolution of these charts has resulted in the discernment of a deeper pattern, which I believe to be of greater consequence than my small potato pension concerns. Look again at the 5 gray lines on red oil chart and see that they are more or less, evenly spaced. Readers of my previous articles will be aware that I do not believe that the spacing between the gray lines to be an accident. 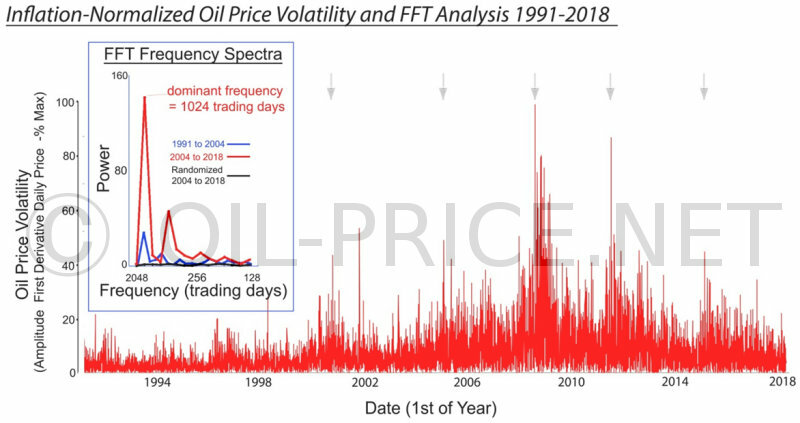 If one uses a mathematical technique called Fast Fourier Transformation (FFT), which is able to pull out repeating patterns in a series of numbers, what is found is that daily oil price volatility has been in a rinse and repeat cycle for the last two decades marked by periods of variability that pop up every three to four years. Now, look to the furthest left-hand side of the red oil chart. What you’ll see is a black line centered on mid-June 2018. As you may have apprehended from my talk of washing machine cycles, this black line represents a guess at when the next bout of instability could hit oil markets. The way that I calculated the position of the black line is straightforward. It is the average for days between each of the 5 gray lines (which turns out to be 1297 calendar days), added to the date of the left-most gray line, i.e. the line that marks the date of the largest spike in the cluster that occurred in 2014. The larger grayish bars around the black line are plus or minus one or two standard deviations around the average – giving a sense of the extended time frame, extending between 2018 and 2019, in which a potential uptick in volatility could occur. I emphasize that my guess for the future timing of price instability in oil markets is not a forecast. There are no certainties. What I am doing is speculating that if the historical pattern holds up, then when we look back from 2020, we could observe a cluster of spikes in oil price volatility in 2018 (or perhaps 2019) of magnitude comparable to those that occurred in 2005, 2008, 2011 and 2014. Moreover, if such a period of heightened oil price variance occurs in the next 18 months or so, then it will likely be followed by a crappy period in the stock market. The previous paragraph could be a satisfactory nutshell to end on – so stop reading if you like. What I am about to discuss next is some thoughts on psychological mechanisms that may be underpinning the relationship between oil and stock markets and it could get a bit (more) nerdy. Fascinating to me, but not necessarily interesting to people not subject to my mild affliction – as my best friend puts it. The last time I wrote for oil-price.net was in 2016, contributing an article entitled, How Oil Price Volatility Explains These Uncertain Times”. To be honest, this piece involved a certain amount of immodest chest puffing, as I was crowing about an earlier 2013 post at oil-price.net in which I had correctly anticipated the rise in oil price and stock market volatility that we experienced between 2014 and 2016. My 2016 article was republished at a number of other locations, including RealClearEnergy, Nouriel Roubini’s Economonitor, Green Tech Media, and Energy Matters, sparking a lively discussion at some of these sites. Green Tech Media readers were by far the most pointedly skeptical. All the same, a benefit of their critiques was that they provided an opportunity to respond with technical details that are hard to put in a journalistically written piece. For example, commenters at Green Tech prompted me to do useful control calculations, the results of which I then posted in the comments section of the article. This included repeating FFT calculations on a daily oil price time series prior to 2000. During this earlier time window, the 1024-trading day cycle seen between 2000 to 2016 was not evident – bolstering the case that a new multi-year oscillation in oil price volatility has emerged since the turn of the millennium. As an aside, astute readers may be wondering about the apparent discrepancy between the 1297-day average calculated from the gray lines on the chart and the 1024-day number resulting from Fourier analysis. Please note that the first estimate of volatility cycle length is based on calendar days and the second on trading days, of which there are around 252 per year. Correcting for this difference brings the two numbers into closer, though not exact alignment. The most enjoyable conversations with commenters on the 2016 article occurred at Euan Mearn’s excellent website Energy Matters. The folk here were also skeptical, but provided their thoughtful input with much appreciated good nature and humor. Issues raised included whether the volatility measurement I was using was diagnostic, and if my indexes took into account the effects of inflation, which if not normalized for, might bias interpretation. Over the last couple of years these comments have led me to do a considerable amount of pondering and reading. Firstly, I wondered, if a cause and effect relationship exists between large sudden changes in the cost of oil and untoward impacts on the economy, what was it, precisely about oil prices, that the market responding to and did my 3D rolling SD sufficiently capture this property. Secondly, to rephrase commenters Nigel Wakefield and Mason Inman, does the sensitivity of the market to energy shocks vary according to baseline costs prior to the emergence of a large transient shift in the price of oil. Let’s address the question of what the market could be reacting to when energy costs undergo large shifts. The other day I was outside on the deck doing some writing. As is my Aspie wont, I was quite focused on the task at hand. At some point, I became vaguely aware that in the garden beyond the computer screen my cat was crouched in a stalk, creeping towards a bird. At once he charged! Immediately, my head jerked up, the muscles in my stomach clenched, and my eyes became intently fixed on the mini life and death struggle playing out in front of me. All this seemed to happen unconsciously in less than a second or two. The bird took wing before the cat could get his paws on it – dude’s lost a step or two. Nonetheless, this pintsized drama illuminates an in-built ability that we have to quickly sense that a situation is undergoing a rapid and potentially threatening change. The benefit of such a mental algorithm to survival seems self-evident. Indeed, maybe a reason that I’m here writing this article is that it helped one of my African ancestors escape the attentions of a large predator considerably more dangerous than my tubby domestic feline. In 1834, the physician Ernst Weber proposed that a change in a stimulus that will be just noticeable is a constant ratio of the original stimulus – a theorem dubbed Weber’s law. Paraphrasing this – in order to shift my attention away from the computer screen, my cat’s “death charge” needed to reach a speed that was sufficiently faster than his initial stalking pace. So how does this cat parable relate to oil price. The 3-day rolling SD that I use to estimate volatility should not be thought of in strictly statistical terms. It is better considered in the context it is being used as reflecting the rate of change in oil price over short time frames. In this sense, it models the velocity of price over time – a property that mathematicians refer to as a first derivative. Our brains seem to have an almost genius-level ability to perform derivative calculus based on information provided by our senses. Thus, in the same way that this mental module enabled me to respond immediately and viscerally to the change in motion of my cat, the market (i.e. the network of people comprising the market) is likely to be responding primarily to this derivative-like property of the price of oil. However, per Weber’s law, the velocity of oil price needs to cross some threshold above baseline before it is detected and acted upon. This threshold effect perhaps explains the previously remarked upon lack of stock market reaction to a spike in oil that occurred towards the end of 2004. 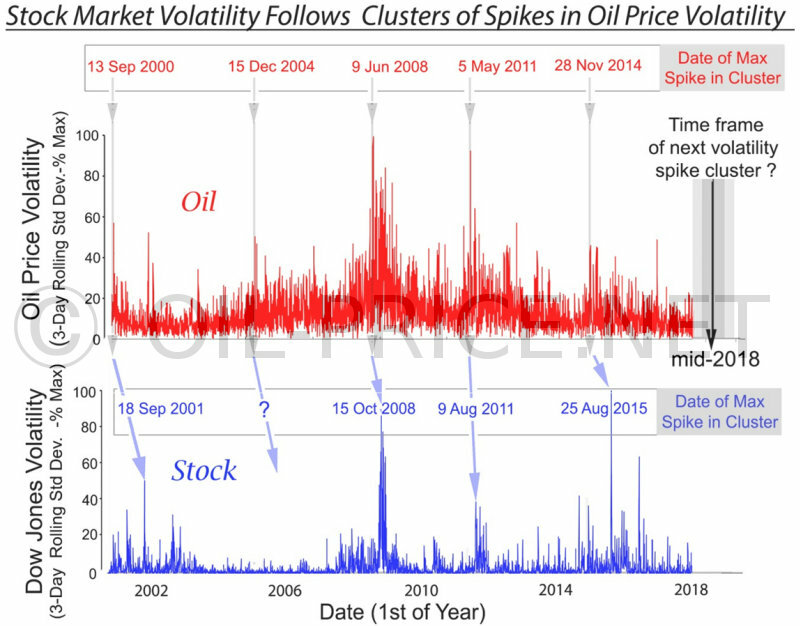 It can be seen on the chart that this is one of the smaller of the notable spikes in volatility occurring between 2000 and the present and that the surrounding spikes making up the cluster appears to be muted relative to the other 5 clusters in the series. On the other hand, it is probably a mistake to interpret the chart solely through the prism that I’ve constructed here – other factors may mitigate the oil stimulus and stock market response. Also, in the same way that even normal hearts can skip a beat every now and then for no particular reason, the effect of randomness should not discounted. The chart below shows the amplitude of the first derivative of oil price between 1991 and the present. The pattern of oil price volatility revealed by this direct measure of the “velocity” of oil price is as near as dammit identical to that disclosed by the 3-day rolling SD – the dates of the max spikes match (gray arrows), the same spike clusters are apparent and FFT indicates the same post-millennial 1024-day-trading cycle – red line on FFT inset in the chart. Readers should also be aware that in response to suggestions at the “Energy Matters”, I used inflation-normalized oil price to do the calculations shown in this second chart. This had the interesting effect of bringing the pre-2008 spike clusters into better relief, and in turn, provided a hint that the cycles in volatility may have gotten under way earlier than I had supposed. This being said, any oscillatory signal captured by FFT from the oil price series before 2000 is only marginal. For example, if the time window for the FFT is shifted to 1991-2004, only small peak at 1024-trading days is apparent on the FFT spectra (blue line on the chart inset). As a further precaution, I randomized the daily volatility values between 2004 and 2018 (i.e., shuffled them like a pack of cards) and repeated FFT. As can be seen from the black line hugging the x-axis in the FFT inset, there is no indication of a repeating pattern in this randomized sequence of prices, providing reassurance that the rinse and repeat cycle detected by FFT between 2004 and 2018 is likely a stable and inherent feature of oil markets over the last 20 years or so. Weber’s law on how and when we notice when things are changing would probably strike most people as common sense. However, research has demonstrated that the brain modules guiding our responses to the market, or indeed instances of attempted bird murder, do not work as straightforwardly as you might think. Recently, this field of psychology gained fascinating new insights, based on, of all things, studies of Rhesus monkeys being taught how to add. Margaret Livingston and her team at Harvard showed, using counting tasks, that the ability to recognize just noticeable differences, when the magnitude of sensory input is changing, is not explained by some type of logarithmic scaling facility in the brain, as had been supposed by the older scientific literature. Rather the mental module or modules governing reactions to sensory discrimination appear to be tuned on a sliding scale according to requirement. I have probably described these results in an overly complicated way. It helped, when I was getting my head around what the adding monkeys were teaching me, to imagine that the brain module in question adjusted sensory input in a manner something like an automatic gain control on a stereo amplifier. Also, if you have a cell phone camera, another way to get a feel for its workings is to think about how hard it is to get a good picture when there are big differences in light and shade, and how miraculously well your eyes generally do at seeing details in all parts of the same scene that you’re struggling to take a picture of. Clearly, the visual system has some extra tricks that enable it to dynamically tune its representation of dim and bright parts of the same field of view. Livingston’s study may provide insight into the second of my questions prompted by Nigel’s and Mason’s comments at “Energy Matters”. My interpretation of her results is that our level of attention (and hence our visceral response) will likely be as impacted by the shock of oil undergoing a sudden change from 1 dollar to 10 dollars, as it would if price moved from 10 dollars to 100 dollars. Thus, it may not be the case that, “people care much more about a 10% change when oil is $100 a barrel than a 10% change when it is $20 a barrel.”? In a changing environment, such as that generated by daily shifts in oil price, the default mechanism that our brain engages likely involves dynamic shifts in sensitivity, or gain, that will calibrate our awareness of the situation and the level of unease that we feel when large changes in the market occur. There are a number of other significant and ineffable considerations to take into account between the instinctive reaction of individuals and the response of the market as a whole. For example, one might consider that the training of market leaders could mitigate the untoward effects of gut reactions (Ha-Ha). Nonetheless, based on psychological first principles that extend from a mechanistic understanding of Weber’s law, I’d suggest that the quantitative approach that I have been using to assess the relationship between oil price volatility and the stock market is justifiable. Namely, expressing oil price as a derivative-like value aligns with how humans may actually process sensory information, and thus diagnostically predicts how we may respond individually, and collectively as a market, to that information. In conclusion, the data appears to continue to support the conjecture that during the last 20 years, a cycling pattern of price instability has emerged in the oil markets. Having said this, I’ll admit that the title of this article is a little disingenuous, as it directs the reader’s attention to the prognostic implications of the story that I tell. Namely, if the 3 to 4 yearly cycle length of the pattern of instability holds, then there is a chance that we’ll see a period of volatility in the price of oil over the next 18 months or so. If this occurs, then it does not augur well for the financial markets. However, I believe a retrospective appreciation of what has happened is much more important than any shaky extrapolations that can be drawn. We can be fooled by randomness, black swans are a real thing and maybe President Trump is responsible for recent gains in the stock market, but in my opinion, what has been going on over the last 20 years is as plain as the nose on our face. We are living through a remarkable period that is teaching us, in the most direct way imaginable, that who and what we are is largely determined by energy and its costs.